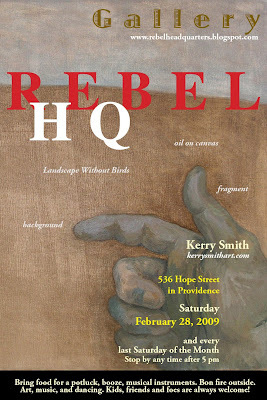 Please join us for the Open House Art Gallery on Saturday, February 28, 2009, starting at 5 pm. We are honored to be showcasing the talent of Kerry Smith, colorful, whimsical and inspiring artist. And a wonderful story teller! Visit: www.RebelHeadquarters.blogspot.com for any past and future info, and tons of photographs from the events. And as usual kindly forward the invitation to friends and foes! This entry was posted in Uncategorized on February 10, 2009 by dorota.